Rest In Peace, Philip Roth, And Thank You NPR's Susan Stamberg shares her favorite conversation with the writer, and what she did after she heard the news of his death. 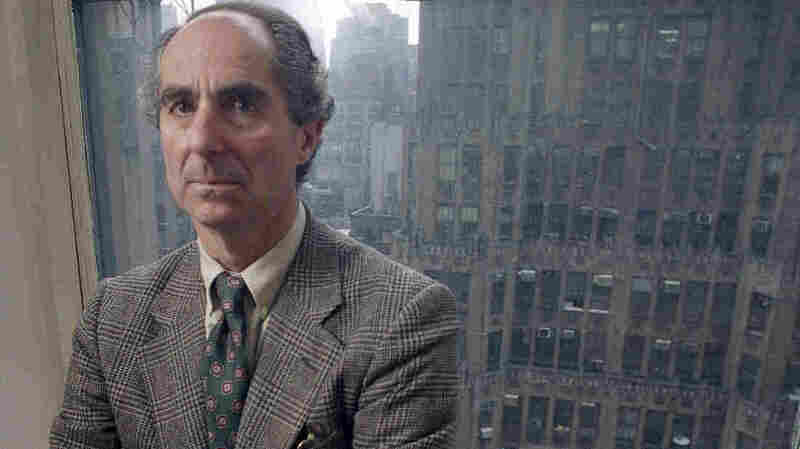 Philip Roth, pictured here in 1993, has died at the age of 85. Author Philip Roth was a hero of mine, and I interviewed him for NPR many times over the years. The conversation I remember best was recorded in 1984. We covered several of his novels, including 1979's The Ghost Writer. In it, the book's hero, 23-year-old aspiring writer Nathan Zuckerman, turns a family fight about money into a story he'd like to publish. Zuckerman's father worries the story is bad for the Jews. I asked Roth if there were terrific stories that don't get written because they're bad for someone. "I don't think any terrific stories don't get written for that kind of reason," he said. "The energy that goes into making a story terrific is not going to be obstructed by that kind of objection. Opposition often feeds the energy itself." I told him about a writer I knew whose mother sued him after he published a book similar to Zuckerman's. "That's a wonderful story!" Roth said. "He should write that story!" "Maybe he will," I told him, "if he can recover from the trauma of his mother having sued him!" Roth said, "If he can't recover, then he oughtn't to be a writer. Those scruples will only get in his way. It's a very unscrupulous profession, you know." One of my bookshelves at home is filled with unscrupulous Roth stories. I own every one of his novels — or so I thought until Wednesday morning, when I heard the news of his death. I went to find my copy of Portnoy's Complaint. It wasn't there — I must have loaned it to my son. Google said my local bookstore opened at 9 a.m. I got there a few minutes later, and found a long line of cars parked up the hill. "Roth fans," I thought to myself. "Hope they're not sold out of Portnoy." Inside, a clerk handed me the paperback copy propped near the cash register. "Oh, I'm so glad you have it! How many copies did you already sell this morning?" I was shocked. This independent bookstore is a magnet for Washington, D.C., readers, and many of their customers are Jewish. Roth is/was a magnet for Jews — often to their fury, embarrassment and disdain. He limned Jewish life in a way that had never been done before, and took a good deal of heat for it. How come the store wasn't as crammed with Roth readers as my bookshelf was with Roth readings? "Yes," said the clerk. "You're the first. But it's only 9:13." Alan Cheuse, All Things Considered's longtime book critic, once told me how, as a creative writing student at Rutgers, he had run across campus waving a copy of Goodbye, Columbus, shouting, "Someone's done it!" Roth, who was seven years older than Cheuse, had written about being young, horny, Jewish and American with a brilliance and hilarity every young, horny, Jewish-American writer wished he or she could achieve. This morning, I flipped through my Rolodex to find the Connecticut phone number Roth had given me years ago (1988, the Rolodex card said). I dialed it. His recorded voice (so gentle and reasonable — unexpected from such a daring, aggressive, no-holds-barred author) said, "Please leave your message after the beep." I didn't. Instead, I leave it here: Rest in peace, Philip Roth. Thank you for all the years of impassioned, inspired work.